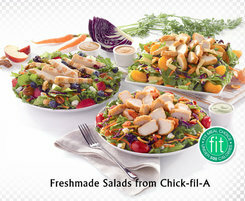 Easy Entries to win 2 coupons for the new Chick-fil-A #freshmade salads. Read the post below and then enter through the form at the bottom of the post. Forget about yesterday, today is #FreshMade! Each day we have a choice, a choice to do the same old routine or do something unique and different. What have you wanted to do for a long time? 2013 is almost halfway over and it’s time to do something new. It’s time to grow, it’s time to make your dreams a reality. • Are You A “Starter”? Quiz – Some of us wake up with pep in our step, ready to conquer the world. Others might need a little kick in the behind to inject something new into their lives! Find out if you’re already raring to to go or need a little help getting the good time rolling! • #FreshMade Activities – Select your mood and let quotes and images from film express how you’re feeling. • See How We Start Fresh – Behind-the-scenes – Get a behind-the-scenes look at how the new Chick-fil-A salads are #FreshMade just for you! • Get Social! Tweet with the #FreshMade hashtag to get your audience excited about the new Chick-fil-A Salads & Wraps. Giveaway: For a chance to win 2 salad coupons for Chick-fil-A fill out the form below. Thank you to Chick-Fil-A for providing the information and the giveaway prize. The prize will be sent out by the sponsor; I am not responsible if a winner does not receive their prize, but be assured I will do all that I can to help the winner receive their prize.